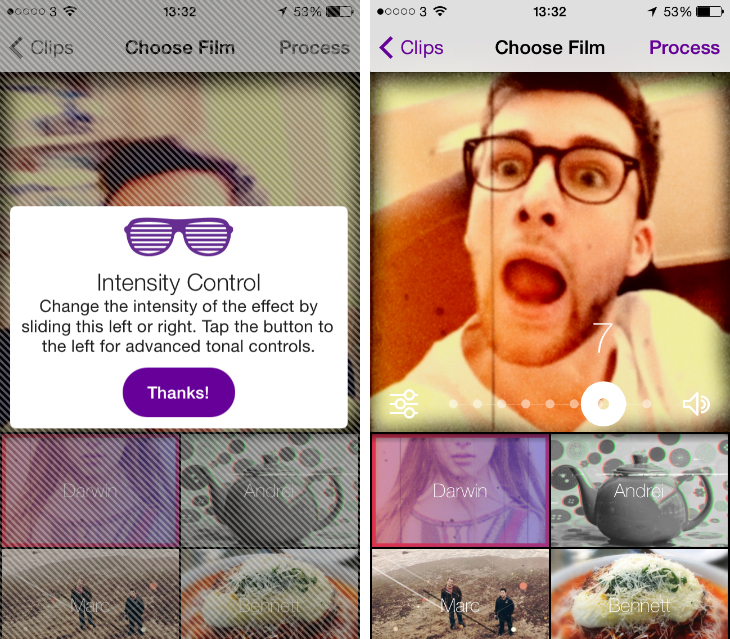 Last month, the makers of Hipstamatic launched a new iOS video-editing app called Cinamatic. Inspired by the tap-and-hold recording gesture pioneered by Vine, it offered a simple way to capture and edit square-format videos. The app was updated yesterday with native iPad support, as well as a number of extra photo-editing features that go beyond what Vine and Instagram currently offer. Intensity control is the most notable addition, giving users the ability to adjust the strength of a filter. Some of Cinamatic’s effects feel quite garish and overblown, so the ability to dial these back is certainly welcome. Similar to Instagram, yesterday’s update also adds the option to import video clips from your camera roll. This opens up even more creativity, as it means you can shoot and edit footage with any app beforehand. Hipstamatic is also introducing a PRO tier that offers additional features for a 99¢ upgrade. To thank early adopters, all of the features will be unlocked automatically for existing users. The extra goodies including being able to import multiple clips and automatically stitch them together, as well as Advanced Adjustment Sliders (AAS) for tweaking the brightness, contrast and saturation in your shot or choice of filter. One final note: Cinamatic now has native iPad support. So you can easily shoot and edit clips on a tablet too, if that sounds appealing to you. Read next: The best thing I ever created: What is mediumalism?